Chocolate comes from the fermented, roasted, and ground beans of the Theobroma cacao, the cacao or cocoa tree. Cocoa trees grow wild in the tropical rain forests of Central and South America where both the Mayan and Aztec civilizations developed a range of chocolate cuisine. The Mayan Indians lived in what’s now Southern Mexico, the tropical Yucatan Peninsula. Initially cocoa was simply harvested from the forest but as cocoa’s importance increased it was cultivated in plantations. Merchants used cocoa beans to trade for cloth, jade and ceremonial feathers. Cocoa beans were also given as gifts at religious ceremonies and other important occasions. 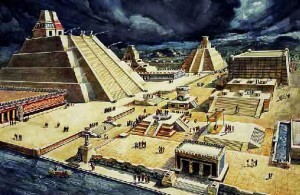 The Aztecs were essentially nomads who founded their great capital city of Tenochtitlan in 1325 in modern day Mexico. By 1400, the Aztec empire had taken over a sizable part of Mesoamerica, eventually conquering the whole of Mexico. 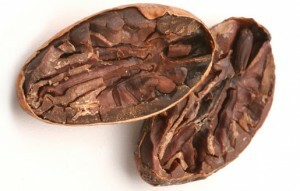 Cocoa beans were as important to the Aztecs as the Mayans. However it was too dry to grow cocoa trees in Tenochtitlan, so the Aztecs had to get their cocoa beans by trade or taxes (also known as ‘Tributes’). The Aztecs traded with Mayans and other people for cocoa and often required that citizens and conquered people pay their tribute in cocoa seeds. Like the earlier Mayans, the Aztecs also ate their bitter chocolate drink seasoned with spices such as vanilla, maize, chili pepper and achiote (small a shrub or small tree), refined sugar and milk being agricultural products unavailable to these ancient Mesoamericans and added later on by Europeans. However we are getting ahead of ourselves in the story of chocolate. The divine drink, which builds up resistance and fights fatigue. In 1518 Hernan Cortés, the Spanish conquistador, landed on the Mexican coast with 11 ships and 600 men. Tasked with a Spanish colonisation expedition to colonise Mexico, he travelled to Tenochtitlan to meet Moctezuma II, ruler of the rich and prosperous Aztecs. Moctezuma gave Cortés ‘chocolatl’, his favourite drink, served in a golden goblet. Apparently Moctezuma used to drink it before going to his harem, and ever since then chocolate has had an (unfounded) reputation of being an aphrodisiac. It is thought that Cortés’ arrival coincided with an Aztec prophecy about a white-skinned god arriving from the east, which would explain why Montezuma welcomed Cortés and gave him lavish gifts. However, relations quickly deteriorated. The Spanish were eventually driven out of the city, incurring heavy losses. Cortés re-organised his forces and in 1521 returned to Tenochtitlán to conquer it. When Cortés returned to Spain in 1528 he loaded his galleons with cocoa beans and equipment for making the drink. Soon ‘chocolate’ was all the rage amongst the Spanish elite. It was purposely kept an exclusive secret amongst the aristocracy with the only people allowed to process cocoa beans being monks. They added cinnamon, nutmeg and sugar – leaving out the chilli that the Aztecs liked – and realised it was more palatable served warm. The secrecy surrounding chocolate meant that it took nearly a century for news of cocoa and chocolate to spread across Europe. Eventually word got out. An Italian traveller, Francesco Carletti, visited Central America and saw the drink being made and by 1606 chocolate was in Italy. It reached France in 1615 when Anne, daughter of Philip II of Spain, married King Louis XIII of France. The French Court loved the new drink of chocolate, believing it was exotic, nourishing and good for your health. Cocoa plantations were set up in Cuba and Haiti in 1684, so in France it became much easier to obtain the much sought-after cocoa beans. When the Dutch captured Curacao, an island off Venezuela, in 1634 they brought cocoa beans back to Holland. Chocolate probably reached Germany in 1646, brought back by visitors to Italy. And then finally it reached England in the 1650s where the aromatic drink became hugely popular in King Charles II’s court. But you had to be rich to drink it – high import duties on cocoa beans meant that it was expensive. Went to Mr Bland’s and there drank my morning draft in good Chocolatte. Soon there were ever increasing numbers of ‘chocolate houses’ in London, where like the coffee shops of today, people went to meet with friends and gossip about the issues of the day over a cup of chocolate. In 1687 an English doctor, Sir Hans Sloane whilst travelling in Jamaica tried chocolate drink, but didn’t like it much. When he added milk to it though, he thought it tasted much better. He brought his milk chocolate recipe back to England, where it was sold as a medicine. 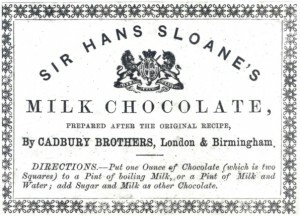 The Cadbury Brothers later used his recipe for the milk chocolate drink that they then produced between 1849 and 1875. Chocolate was getting more and more popular, and to meet the new demand, cocoa plantations were built in the West Indies, the Far East and Africa. As a result of this, coupled with the reduction of the high import duties in 1853, the price of cocoa beans gradually fell meaning that chocolate was now available to a larger percentage of the population. However it was all still about a chocolate drink – solid ‘eating’ chocolate was not invented until early Victorian times. It wasn’t until Bristol company Fry & Son made a ‘chocolate delicieux a manger’ in 1847 that the first bar of chocolate as we know it today appeared. It was a mixture of cocoa powder and sugar with a little of the melted cocoa butter that had been extracted from the beans. The result was a bar that could be moulded. It might have been coarse and bitter by today’s standards, but it was still a revolution. Moulded into blocks and bars, and poured over fruit-flavoured centres, this plain chocolate was a real breakthrough. In 1875, a Swiss manufacturer called Daniel Peter added powdered milk to make the first milk chocolate bar. 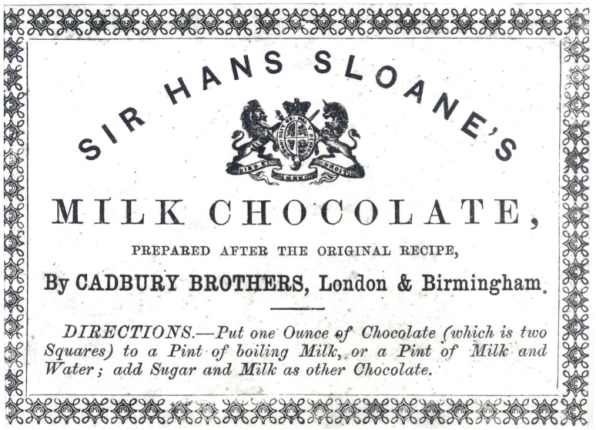 It wasn’t a completely new idea – Cadbury produced their milk chocolate drink based on Sir Hans Sloane’s recipe between 1849 and 1875. And Cadbury added their own milk chocolate bars in 1897. Recipes have been continually refined and improved over the last century or so but essentially the modern chocolate bar had been born.